We are here to effectively exterminate termites for once and for all. Our company provides the most advanced termite control services in Dapto and we can ensure the end of your problem. All City Pest Management Dapto understands the impact termites can have on your assets or business. Our key philosophy is reducing your distress as fast as possible with our advanced termite control services. Termites can damage properties and If not dealt with immediately, reparation can be costly. Rest assured our termite inspectors are here to help and produce successful termite free results. For advanced termite control in Dapto, All City Pest Management Dapto should be your first point of contact. Our Termite Control Dapto provides immediate assistance to find and eradicate termite. We are on call to provide you with prompt service. Your problem is now in our hands. Our skillful team is efficient and professional with extensive termite experience. All City Pest Management guarantees complete termite control and ultimate customer satisfaction within a short amount of time. 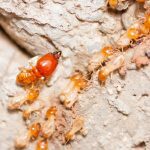 Another positive side of All City Pest Management is our attractive termite control prices. We offer an affordable termite inspection and treatment to protect your valuable assets. We also pride ourselves on our return policy. If infestation did ever reoccur we will return as many times as it takes to ensure complete termite control. Our revisits are impressively at no extra charge. A worry for many when contacting termite control services Dapto is the fact that repellents themselves can be harmful. Here at All City Pest Management Dapto however we use 100% natural repellents with our advanced termite control and treatment. Our methods are completely secure and efficient. There is no need to worry about any side effects impacting your clients, children or pets safety.